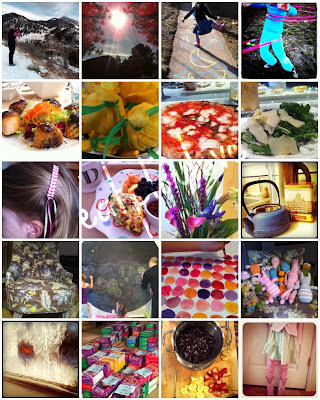 I love reflecting on the month through photos. Like the bottom left corner photo, it's an ice covered window. We had an extremely cold snap in February that felt never ending and our single pane windows iced over horribly. February was also a great month for the house, I got paintings and pictures hung on the walls and the chalk board circle painted on the wall (2nd in from left and 2nd from bottom). I enjoyed a few meals out, always feeling so lucky to have wonderful food so close by. Boulder is a mecca for fabulous local restaurants. Girl Scout Cookies, hikes, and taking advantage of warmer days. A few glimpses into Valentine's Day, painting circle bookmarks and ribbon barrettes. Tonight was parent visiting night at Sj's school. 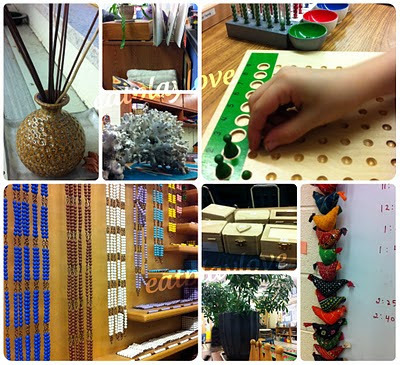 We accompanied her to the classroom and she walked us through a checklist of work in progress she wanted us to see. She attends a school where her education is self-driven, meaning she works on what she wants to and pursues studying and researching topics that interest her. The former conventional fifth grade teacher in me always wonders how that really works, but when you see it in progress, all those traditional notions I held onto easily fade away. Self driven education is a wonderful thing. You won't find 25 Abe Lincoln reports donning the bulletin board in her classroom. To me, I wouldn't have it any other way. It's that time of year when our favorite lunch go-to's may be too played out, I'm talking to you peanut butter and jelly sandwich. 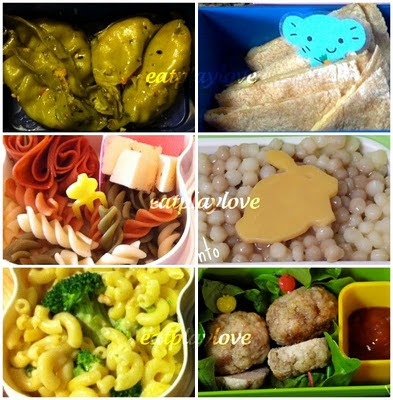 While we all know are children are fortunate to be having a homemade lunch, it's also hard to find lunch inspiration. Packing lunch does not have to be a time consuming process. I take about 5 minutes to put lunch together in the morning (I'm not a night before packer). 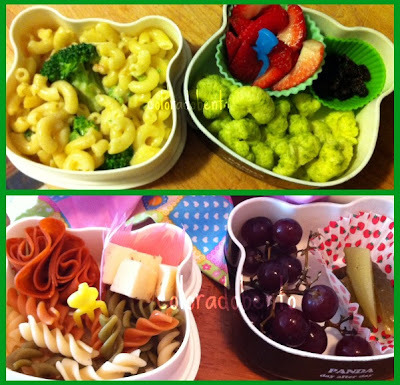 While I would love to make creative lunches everyday for my girls, the reality is time and what's on hand. I am a huge fan of using leftovers for lunch, which also means thinking ahead like making some extra pasta or buying an extra package of dumplings. I only pack a sandwich a couple times a week, otherwise I repurpose leftovers in a fun way! Last night we had take away for dinner from a local fast food Japanese restaurant. I asked my husband to pick up dumplings for the girls so I could pack them for lunch today. They love having a variety of foods for lunch, so the dumplings are perfect. 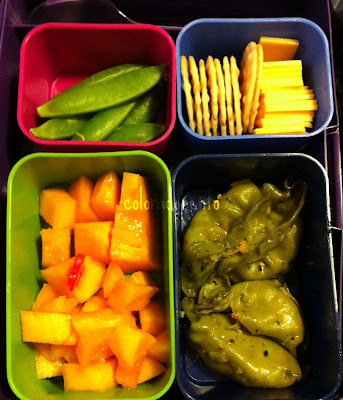 Also included, cantaloupe, snap peas, teriyaki rice crackers, and cheddar cheese. Laptop Lunch packed and ready to go in less than 5 minutes. Quite often, I fall into the "lunch must have a sandwich" mentality. Honestly, that's what I always had growing up, a sandwich with a few ziploc baggies on the side. Luckily with bentos we can literally let go of what a lunch must be and open our possibilities. Both lunches I packed for my 4yo this week didn't even have bread! Bentos are the perfect way to switch up leftovers and make lunch more interesting (even if it is leftovers). Mac n cheese with broccoli, strawberries, vege booty, and raisins. On Tuesday the weather was beautiful, after a tour of Third Street Chai (more to come on that) I decided to hit the trail for the last 1.5 hours before school pickup. Even though the sun was shining bright and the temperature was nice and warm, the hard ice and snow pack on the trail had yet to melt off. 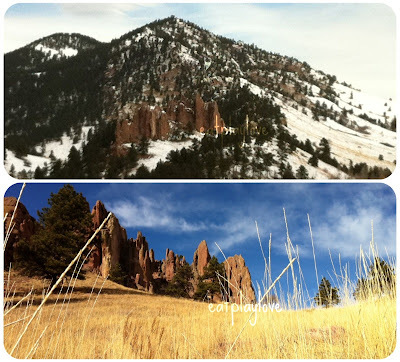 The photo on the top left was from the trail on the initial climb. It's hard to navigate the trail when it's like that, it becomes very slippery and often I do a bad thing and move off trail just a bit to help gain my footing. Once I was to the top and hit the main trail, it wasn't as bad. I glanced off to my left at one point and saw a beautiful spot with some rocks and trees to take a photo. In my usual fashion when taking photos, I typically sit on the ground or rocks to get a varied perspective when framing the shot. I'm not really much of an overpriced dozen of red roses kind of woman. I much prefer a mixed bouquet of wild flowers for a 1/4 of the price any other day of the week. While I do cherish the diamonds I have, I'm a sterling silver handmade by a local artist, kind of woman. I'm not much for paying double for a meal at a favorite restaurant because it's Feb 14th, cook for me. While I do sometimes fantasize about grandiose gestures, it's love letters I quite often miss. 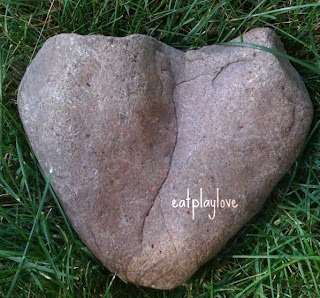 Little things like a heart shaped rock, maybe a mixed tape. 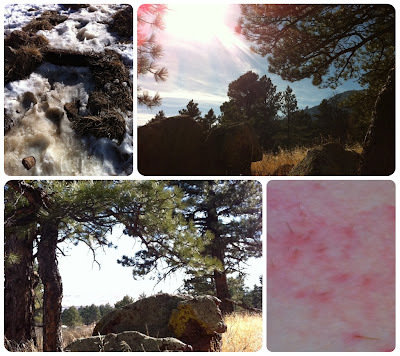 Saturday morning hike, snow packed trail, occasional bursts of sunshine, wonderful conversation with a friend. I have to admit, friends that want to join me on the hike, always make the experience that much better. For that I am grateful. We hiked up Flagstaff Mountain and the top photo is a view across the valley on our trail. Funny enough I hiked that on Day 4 (Settler's Park). I thought it would be fun to put both photos together, dramatically different weather days just a couple of weeks apart. It's all about the inspiration. Are you feeling it? Even though there wasn't a class party, the spirit of Valentine's Day was captured in her fanciness. I want to be that cute. We typically buy Valentine's, but this year we made them. Painting circles for handmade Valentine bookmarks. Watercolor with ribbon finished bookmarks in a follow up post. My day today was rounded out with a pickup of 46 cases, aka 552 boxes of Girl Scout Cookies. Ah, the life of a volunteer. If I got paid for all the work I manage to juggle, I'd be on a beach right now. I'm over at Mile High Mamas today, I wrote about my weekend at Arapahoe Basin Ski Area where I skied for the first time ever in Colorado (did I just admit to that)! Oh and so did my 4 year old. Come read about how Sj, smiled and laughed at me as she took the lift to the top of the mountain and I was on the bunny hill. I truly never thought I'd see the day. Tuesday Tips: My Favorite Brands Stance on GMO's? Whole Foods, Annie's Homegrown, Back To Nature, and SILK Soymilk's Response. After the last couple of weeks and the passing of deregulated Genetically Engineered alfalfa by the USDA, all sorts of thoughts about GMO's (genetically modified organisms) have come rushing into my head. The long and short of it is, organic products are free of GMO's, it's part of the USDA organic certification process, but what about those "natural" products that aren't certified organic? Are those "natural" products full of GMO's? I contacted 4 companies to get the word directly from them. This post was inspired by a conversation on Twitter. I was a bit annoyed that someone who is well known for their baking blog wrote recipes calling for canned frosting. Now, what you use in your own home is your choice, but someone making a living calling themselves a "food blogger" using canned frosting is a FAIL in my book. Once you make buttercream at home, there's really no reason to ever buy canned. I could make a 1,001 comparisons, but really homemade is the way to go. There is no chemical aftertaste, it spreads like butter, it has real ingredients, and it tastes divine. If you really need a shortcut, used boxed cake mix instead. Homemade frosting takes about 5 minutes. You don't need fancy ingredients either, this recipe uses 5 ingredients. It was Friday, we were running late. I was hoping for a slam dunk, just buy hot lunch today moment, when we discovered it was chicken pot pie. Pass! So I literally had 2 minutes to get something together and get out the door. Cheese quesadilla on whole wheat tortilla, very lightly toasted, so it's soft. Don't let it crisp up, it turns into flatbread by lunch time if you don't pull it out early. 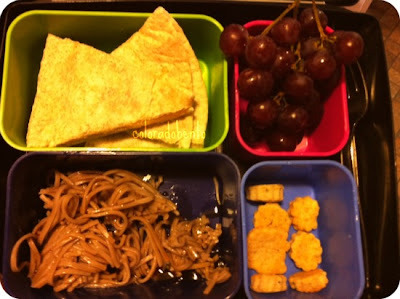 Grapes, homemade cheddar crackers, soba noodles with some sauce I whipped up for dinner the night before. There is broccoli hiding in the soba noodles, you just can't see it and remember the 2 minutes to prepare lunch, that includes this awful dark photo. Enter the 5 minute bento, for my preschooler. 1/2 Rudi's organic cinnamon raisin bagel with cream cheese, grapes, red pepper and carrot flowers (ooh, too cute), red container has ranch (of course), and two Japanese EveryBurgers for a special treat. What a difference 3 minutes makes. I Took The Plunge, Please Come See! I started Eat Play Love in 2007 and beyond a few tweaks of the header every so often and from 2 columns to 3, I've never changed the design. Hint: the DOTS are gone! Please come click through and see what I did to the place! ps...I have to switch up my header to remove the rounded corners, but other than that I'm liking it. Today I proved that I'm not like most women. I had a few hours of desperately needed free time and instead of getting a pedicure, running errands, or hitting the gym, I took myself to lunch. 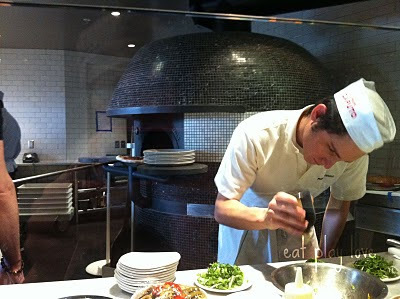 Pizzeria Locale opened a week ago Tuesday and I've been eagerly waiting for the right moment to pop in for lunch. I put the latest issue of Velo News in my purse and after preschool drop off, headed to Pearl Street. On Sunday, I stuck to my guns and stayed off my computer for the day. If you want to know the exact details, I actually had to hide my laptop out of sight so I wouldn't be tempted to just hop on for a minute. I put my iPhone in my sock drawer with the sound off and called myself unplugged for the day. Which left me with a long to do list in hand while also keeping the girls occupied. Recently, I've been longing for a cosy for my teapot. A proper tea connoisseur does not live with out a cosy for her teapot. Living in a Starbucks obsessed country, it's not easy to just run out and get your hands on a cosy. Yes, I regret not picking one up when I was in London last year. Oh the guilt I carry. If you put my my longing for the teapot cosy together with a day unplugged from the computer, the final result is the photo to the left. I knit my very own teapot cosy. Yes, I knit that! 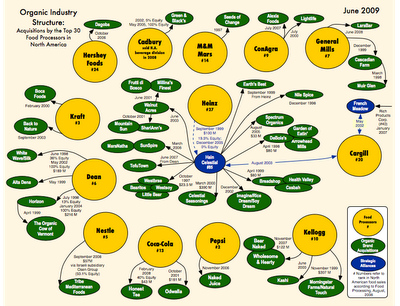 Back in January of 2009, my eyes were opened to a trend in the organic industry that I was very naive about. It was during a recall of peanut butter and products all tying back to the supplier, Peanut Corporation of America. I was surprised to see one of our favorite go to snack bars, LARA maker of the five ingredient or less Lara Bars, was on the recall list. Instantly I thought that was odd, I assumed a small Denver based company would not have such a mega-supplier. But turns out I came to learn a few things about Lara, the first being they were sold to General Mills. Read my original post here. After doing some further reading, many parent companies of small organic brands came to light. I think the biggest disappointment for me is that quite a few organic brands have such a mom and pop persona, when purchasing them you feel like you are supporting something good. In some cases, the reality is you're just improving the bottom line of a tobacco company. Gulp.